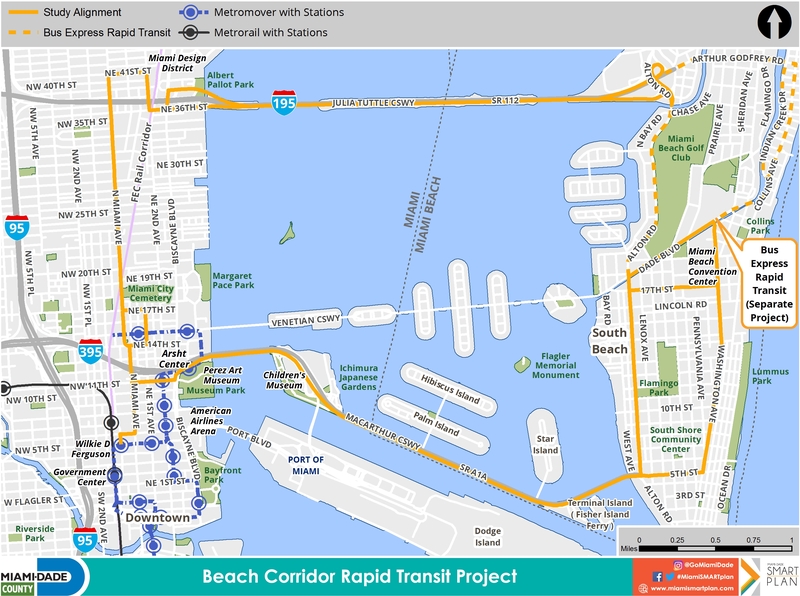 The Beach Corridor is one of the six rapid transit corridors of the Strategic Miami Area Rapid Transit (SMART) Plan. The Beach Corridor runs from the Design District/Midtown Miami and Downtown Miami to the Miami Beach Convention Center area. The Department of Transportation and Public Works (DTPW) is studying the implementation of the Beach Corridor Rapid Transit Project. The study aims to identify locations for transit stations, Park and Ride/transit terminal facilities, and the implementation of a cost-effective, high-ridership, new premium transit service with supporting pedestrian and bicycle facilities. The Tier I evaluation considered seven rapid transit alternatives and developed alignments which recommended further analysis of four rapid transit alternatives. Additionally, a Miami Corridor Analysis report was completed to analyze north-south corridors that connect Midtown to Downtown Miami. Currently, the tier II evaluation of the four shortlisted rapid transit alternatives is in progress. This tier II evaluation includes additional scope of work for an expanded study area (Miami Beach) and an additional technology assessment (Personal Rapid Transit). To learn more visit the Smart Plan website. A public meeting to discuss the recently expanded study area, as well as the additional technology assessment for the Beach Corridor Rapid Transit Project, took place at the Miami Beach Regional Library on Monday, Dec. 17, 2018. Two public meetings (PDF) were held to provide detailed information about the Beach Corridor study on July 25 and 27, 2017. On, July 30, 2018, DTPW provided a presentation to industry experts regarding potential project delivery and finance structures for the Miami-Dade County SMART Plan. The presentation took place at Miami Dade College Wolfson Campus. Miami-Dade County Director of Transportation and Public Works, Alice N. Bravo, P.E., explains the SMART Plan on NBC 6.